It’s been a little bit since I started my pairs preview with Russia and China and I’m starting to feel the pressure to complete it before the beginning of the season. (It’s a little awkward to preview things after the fact.) So, let’s continue with the North American pairs where there are some interesting stories developing for this season. The U.S. has six pairs competing in the Grand Prix this season (five with two assignments) and a few new, emerging teams as well and they are all competing for that one spot (still) for Worlds. If this situation does nothing else, surely it’s going to put the pressure on everyone to focus, improve and compete. The team that can do that has a good chance of winning it. Chris and Alexa have a brand new coaching situation going into this season, working with Aljona Savchenko and her coaching team of Konig and Ballestar both in Chicago and Germany. It is a BIG change but I think a change of some kind was definitely in order because things seemed to be unraveling last season. Despite the fact that there really was no other team to challenge them for the top U.S. spot, they really struggled in competition. It all felt shaky. We know they have the ability and the elements but they really need to bring it this season, competitively and artistically. They can often feel detached and mechanical which I would love to see change. They have been close to breaking through a few times but it has never really happened in a sustained way. If this change doesn’t make the difference, what will? I think it’s sort of now or never. For Kayne and O’Shea, I think there is chance to challenge for top U.S. spot. I think these guys excel as performers and story tellers and we know that they have interesting programs. They are keeping their “Swan Lake” free program from last year (it was a short season for them after all) and I think it is terrific! I also think that these guys are better competitors mentally than some of the other American teams. And with some improvement to their twist, with help from Dalilah (now that’s interesting! ), and possibly more attention on skating skills, I think they could make things quite interesting. If they seize the opportunity, I think they can really show up and capture some attention. They just need to be consistent. With consistency on their side, I could see things possibly shifting. Hopefully she is recovered and healthy to make it all possible. Denny and Frazier have also changed their coaching situation but instead of moving onto something new, they gone back to something old. They are back under John Zimmerman. I think this could be a very good thing. Before her injury, they had a breakout season in 2014-15 back when they were with Zimmerman. I feel like their material since that season has been very ho-hum (although I mildly enjoyed their free program last season), so I am hoping they come out this season with better programs AND costumes and a new umph. 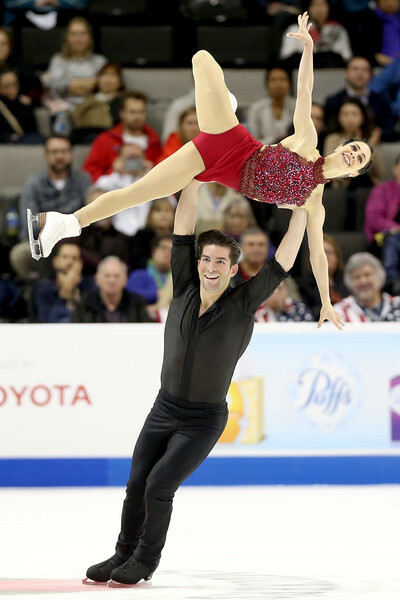 I felt badly for them when they seemed to be left out in the cold by USFS after their disappointing Worlds in 2017 but surely if last Worlds showed anything, it was that other American teams also bear the responsibility for the single American pair slot situation. I think Denny and Frazier have a chance again and I hope they come through. Let’s just all pray for her jumps. I’m sorry guys, I’m just not a fan. To be honest, I didn’t include them to start because I didn’t know what to say, and then sort of forgot about them, but then I remembered that they have two Grand Prix assignments, so here they are. Cain and Leduc look like they are having a lot of fun as a pair but they just don’t cut the mustard with me. I’ve thought about this a bit and this is what I’ve decided: they try to capitalize on their singles skills and so put everything in – spirals, jumps, and spins – but not always with consistency (jumps!) and not always in an aesthetically pleasing way (I’m sorry Tim, yes, you are flexible, but that side-by-side spin position is just not matching or working). Then when you look at their pair skills, it’s the same situation – not very consistent and downright sloppy at times. That is my general impression. (It’s sort of similar to my feeling about Marchei and Hotarek’s lifts, but that was confined to their lifts and eventually my feelings changed… after three seasons.) So, I will say, I think Cain and Leduc have been rushed and pushed forward, before they were really ready. I don’t really think they are the future of U.S. pairs figure skating and I think they have been unduly preferred over teams with more potential but maybe I will be proved wrong. I guess it’s possible. I’m so happy Deanna and Nate have two Grand Prix assignments! I was hoping a second spot would come through for them. They have been continually improving. Really, despite not making the free program at Worlds this year, I think they still did very well. They skated third in the short, meaning ranked in 26th place (since they skate in reverse order of ranking) and moved up almost nine spots alone in the short, finishing in 17th. I think that’s pretty good for you first Worlds and without much international exposure. I think things can only get better! We’ve had a sneak peek of their new programs and they look pretty good and they are one of the few teams with a quad throw too (if they end of competing it) – they could be, will be, I think, right there in the mix, but again, they will need to show consistency. I’m excited to think about this internal competition! Things have been fluid for the past couple of years, with no team really dominating. I think anyone could come out on top but they have to bring it all season long. Lu and Mitrofanov are a new team to the Senior circuit. They are moving up from Juniors and so, I decided to include a video for those who may not have seen them before. This is their free program from last season at Junior Worlds, where they placed 5th. Yes, it’s a combination of Cats and Phantom of the Opera. I don’t know why. Now that we’ve dealt with that, let’s discuss them. They seem like a confident tea – fairly unflappable, fairly strong competitors – which I think is a good place to start. There’s lots of room to grow but they are strong jumpers and have been progressing steadily. I’m really interested to see what they look like this season. She will be just 16 at the beginning of the season and at the end of last season she still looked like she hadn’t really hit puberty yet, with that slightly gangly look, like her feet have grown but nothing else has caught up. It could all work out to be fine, maybe with a year of adjustment, but we all know Junior teams don’t always make it, so I’m waiting to see what happens here. There are several other teams in the U.S. and one more Grand Prix assignment up for grabs. I assume the “To Be Decided” slot for Skate America will be decided by how these other teams fair at their opening Senior Bs. There is Deardorff/Settlage competing at US Classic. (Lu/Mitrofanov will also compete there but I don’t think they will get a second spot GP spot.) Digerness/Nuedecker compete at Lombardia, then Calalang/Johnson at Autumn Classic (Jessica Calalang and Brian Johnson both split from their previous partners and have partnered up), followed up by Pfund/Santillan at Nebelhorn. Who is going to get the spot? I’m interested to see! I just want to say, did no one consider Jessica Calalang and Mervin Tran as a pair? I think that was a missed opportunity. In Canada, the pairs scene has taken a little turn from the expected course with the split of Seguin and Bilodeau this summer. The field has lost the depth it’s had in the past four years but there are some teams to watch during the Grand Prix this fall. Moore-Towers and Marinaro are clearly leading the field and Canada Team Number 1. They won’t be in the same intense internal competition that they have been; they will be eyeing the other top teams in the World – that’s who they want to compete against now: Zabaijako/Enbert, James/Cipres, Peng/Jin, Della Monica/Guarise. It’s certainly a different situation for them. I wonder how they will fare with the pressure that comes of being the national leader? But, if Worlds was any indication, they want to compete. They really turned in a good showing there, even coming fourth in the free skate. They are building a reputation as a consistent team, one that delivers. Now, I feel like they just need some kind of wow factor – we aren’t getting it in their twist or lifts, although her throw landings are pretty great – and they need GREAT programs. I’m worried that’s not what we are going to get, but I hope they are working on it. Walsh and Michaud are Canada’s new Senior team, just out of Juniors, where they placed 6th at Worlds this past spring. (The video however is from Canadian Nationals 2018 because the video I could find of their free skate at Junior Worlds was wonky.) Earlier, I wasn’t too confident about Walsh and Michaud making it together as a Senior team but as I’ve gone back and re-watched their skating, I’m starting to feel that they actually have a better chance than a lot of Junior teams when they move up. For one thing, I was feeling concerned about Evelyn’s height compared to Trent’s, but looking at them, I don’t think she is going to grow more and he seems to be very strong and sure in his partnering. I was also concerned that she didn’t really have the pair skills and look, having switch from from singles to pairs to skate with Trent only two seasons ago. But again, as I watched I was amazed at how much she has gained and improved in those two years. She seems quite comfortable in the elements and her extension and line has improved so much. I only expect the pair elements to continue to improve. And on top of that, they seem like quite a mature pair. I think they are ready for Senior. I don’t think it’s any secret – I really like these guys. They have all the sophistication and chemistry you could want except for that darn triple twist! However, from video from a summer competition, it looks like they are going for it, that it is there but just. Well, sometimes it goes like that. It just takes time but it gradually gets better (I’m thinking of Ziegler/Kiefer right now and, well, lots of other teams). I’m a little concerned about her jumps too but what I think it comes down to is competitive experience and perhaps working on that mental focus and competitive spirit. I think they have something really special, that they can look really great on the ice, but they are going to have to fight with Walsh/Michaud for that second spot cause that’s all Canada has! No third berth this year and there is no clear second team right now (W/M struggle a bit with the twist too). It’s going to be interesting to see who seizes the opportunity. Maybe this is the start of a beautiful rivalry? The pairs field in Canada is pretty small right now but I hope we get to see Julianne or Charlie with new partners, maybe later this season? Or even better, both of them! But I think Julianne has a better chance of getting a partner sooner (if she continues… I hope she continues), since Maxime Deschamps and Francois Beaudreau-Audet are both looking for partners! I would love to see both of them skating too. Let’s find some of girls for these gentlemen!